Since there were only two entries I decided to do both. The first is by the wonderful Kimberly Trevino. Aren't those flourishes amazing? (Click on the image to see the full card) This is where I drew my inspiration from on this card. I hand sketched some flourises on SU! 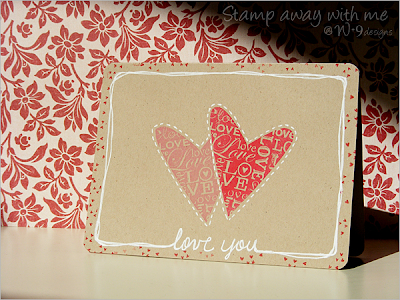 's kraft card stock, and then came back in with my white gel pen to trace and add some whimsy. When working with the white gel pen be sure to move slowly. If it does skip some on you, I found that you could go over it again after it was dry. I added a few little birds in the mix and a sentiment, then finished it off with some inking around the edges. The next CASE comes from THE fabulous Kerrianne Gwin. 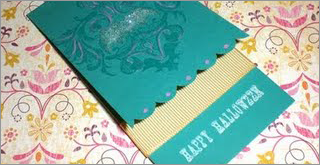 I just loved the way this layout incorporated the inside of the card. Cutting the top layer shorter was ingenious. (Click the image to see the full card) I used this as my inspiration. I kept the layout out pretty much the same, using a single bold image as the front and adding a sentiment to the bottom of the inside. Again, I hand sketched a "not so spooky" spider web and then traced over it with the white gel pen. Boy that thing is getting a workout lately. 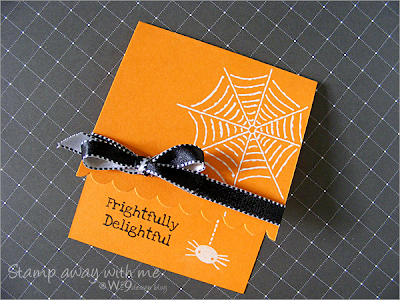 Then I added a cute little spider and my sentiment, and tied it all up with a bow. I hope you enjoyed looking and I will be posting another challenge this week. If you have an idea for a challenge focus, please leave comments. I'd love to read how you guys would like to be challenged! Halloween is just around the corner, are you ready yet? No? Well don't worry, you still have time. We created this fun little card last weekend at club. 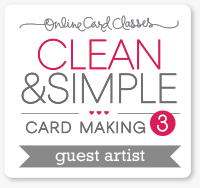 It is super simple and very quick, easy for mass production. I cut the circle using the Circle Scissors Plus, stamped that perfectly spooky tree from SU! 's House of Haunts in Versamark and embossed with black. 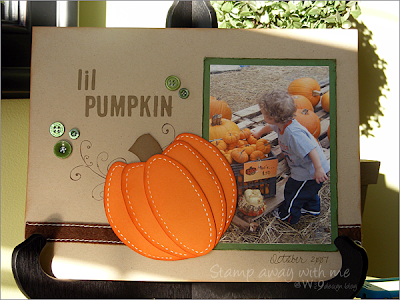 All of the images in this set are great for embossing! I finished the "moon" off with a little inking around the edge with Summer Sun. 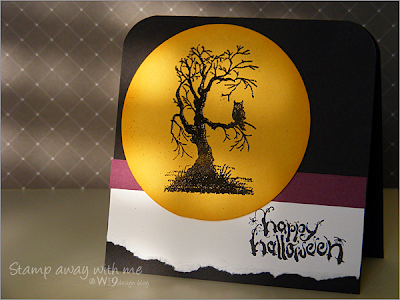 Two pieces of cardstock layered on the card front, stamp the sentiment (also from House of Haunts), round the corners, and pop the "moon" with dimensionals. Done. Hope you enjoy! I will be back tomorrow with my Inspire Me Challenge CASEs. Isn't that the most adorable pumpkin ever?! I got the template from Kristina over at KWernerdesign.com. She used it as a shaped card, but when I saw it, I just knew I wanted to use it on a scrapbook page. There is so much fun on this page for such a simple layout. Lots of inking and some scissor distressing for that "old worn" look. The girls loved creating their own at Club this past weekend. Hope you enjoy and don't forget to leave comments! Introducing the "Inspire Me" challenges. I hope you guys will enjoy this and play along. Each time I will pick something different, a color combo, a technique, a product, etc...and I will be calling on all of you to inspire ME. At the end I will choose an entry to CASE. Here are the details: Anything goes, any color, any product, you can have some embellishments (buttons, rhinestones, etc...) but keep it to one layer of cardstock. 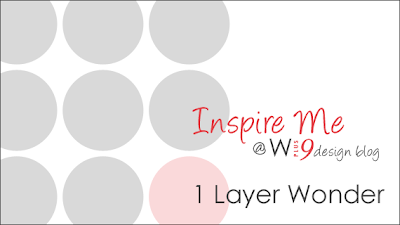 Post your creation to your blog or online gallery and then leave a link via Mr. Linky below. You have until 8:00 p.m. EST Friday, Sept. 18th. I can't wait to see what you come up with! 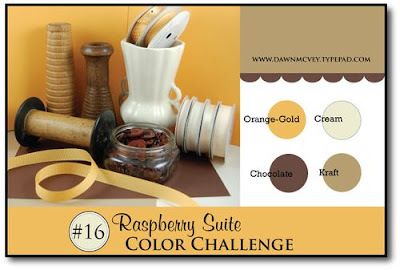 Today's card is for Dawn McVey's Color Challenge #16. I love these colors! I actually worked with the color palette a couple of weeks ago...inspired by the pattern on the inside of my flip flops! LOL I used Kraft, Crushed Curry, Very Vanilla, and Chocolate Chip. On to the card details. I loved how this card turned out. It's aaaaalmost vintage. Or at least as close to vintage as I'll probably ever get. I love the vintage style, but can't ever seem to pull it off. I think my style is definitely more "less is more". 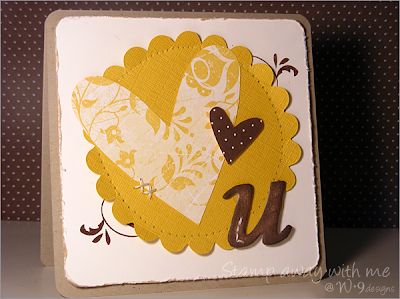 The hearts and scallop cirlce are die cut using the Big Shot. I stamped a little flourish behind the scallop, just so a little would peek out. I wanted to bring out the flourishes in that Razzleberry Lemonade designer paper. Then I colored some naked chipboard and poked a few holes in it to add some stitching, added a few little x stitches to the edge of the heart, and finished with some paper piercing on the scallop. Done.